You'd like to enjoy sunny vacation amid breathtaking landscapes? Choose Southern Corsica and its beautiful scenery! Explore the rugged coast, enjoy the hidden coves in the surroundings of Bonifacio, visit Porto Vecchio, the city of salt, and hike in the mountains of the Alta Rocca, thus discovering small villages. Our Corsican rentals and other accommodation in Southern Corsica will offer you an ideal starting point for a discovery journey in the region. Authentic and preserved, Southern Corsica reveals its secrets to curious visitors: from the Bastelica pozzines to the Gulf of Porto, the scenery is rich and diverse. Remarkable sites reveal the wonders of nature and historical treasures: visit Cucuruzzu Bronze Age village, the Lavezzi Islands nature reserve, and the Aiguilles and Col de Bavella – great for hiking. Wherever you choose, your holidays in southern Corsica take place in a dream setting by the sea, in the mountains or in the countryside. What’s more, it couldn’t be easier to choose and book your Corsica accommodation with Gites Corsica : we offer Corsica gites, city apartments, bed and breakfasts, campsites and villas for all budgets. 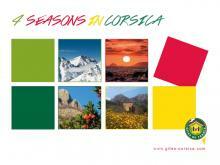 Gîtes de France Corsica referenced for you many accommodations: B&B and rentals in Corsica. This wide variety of accommodations enables everyone to find the perfect place for a family vacation, with friends or head to head. You can already organize your stay on the Island of Beauty by booking your rental on our site!